Ok, hands up. I eat lunch at my desk. Every day. There is a canteen at work but I find pretty much everything to be too greasy and/or expensive so as we have a communal fridge I prefer to bring in my own lunch which I'll usually prepare the night before. The downside to making my own lunch is that I tend to get stuck in a rut and make the same thing day after day which after a while is, quite frankly, dull! I am picky though - I don't want anything too heavy or else I feel the need for a nap around 3pm and am always conscious that there are people around me and I don't want to stink the office out! So, what do I eat with all of these requirements? Here's how I keep my lunches interesting! Mmmmm.....qyoza....I could honestly eat these every day and are perfect for lunches - just make extra the night before and then either microwave or eat chilled. Check out the recipes I have for pork and seaweed gyoza or pork and garlic gyoza. Don't forget your dipping sauce! I keep the little plastic sauce containers that you get with a takeaway as they are perfect for sauces, dips and dressings on the go! This is another leftovers lunch that I love - crisp, fresh and super healthy! You can put pretty much anything in these handy rice paper wrappers and I've even seen recipes using leftover roast chicken, duck or beef! I prefer to keep it raw so use various veg that I might have in the fridge. Egg salad is almost crossing the line for me when it comes to lunch that might offend colleagues but y'know what? It's so good and simple that sometimes it has to be done! You can make a plan egg sandwich but it's also really nice on a rye cracker sprinkled with finely chopped spring onion. Ok, so there's not a huge amount of cooking involved in this but it's filling, healthy and quick to make! I make the cous cous the night before using either a packet of cous cous from the supermarket or soaking plain cous cous with a bit of garlic powder, black pepper and spring onion. 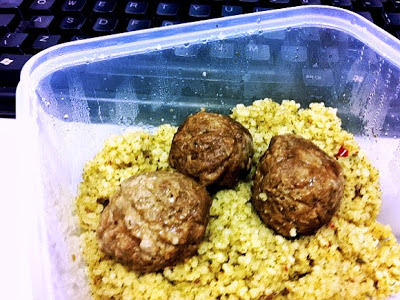 I refrigerate the cous cous overnight then in the morning I put a few of the frozen Quorn meatballs in the container, keep cool at work and microwave for a couple of minutes. Sandwiches are boring, right?! 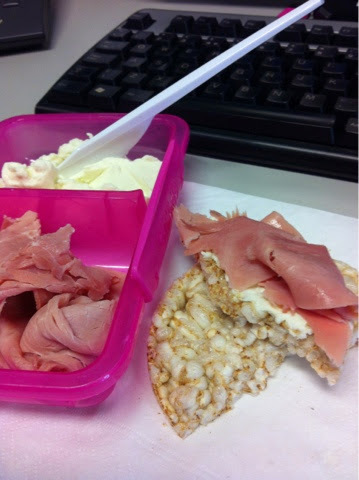 Well mostly but put your favourite sandwich fillings on a rice cake and it makes lunch a little more interesting and there are so many different flavoured rice cakes or corn cakes that the possibilities are endless! My favourite at the moment is cream cheese and smoked ham but you could use smoked salmon and cream cheese, pesto and chicken, cheese and tomato...I'd suggest keeping the toppings separate to the rice cakes until you're ready to eat them or else you'll end up with soggy rice cakes! Leftovers are great for packed lunches and so effortless because all you need to do is make a little extra dinner the night before and you're good to go! I love taking in leftover cottage pie, lasagne, stews (today I had leftover roast chicken with roast potatoes, carrots and a yorkshire pudding)...The list really is endless!